* Photo courtesy of the Bermuda Gold Cup. Head-to-head: Britain’s Ben Ainslie matches up with Christopher Van Tol of the U.S. in racing on Hamilton Harbour yesterday. Three-time Olympic gold medalist Ben Ainslie has returned to the waters where he launched his glittering sailing career this week to compete in the King Edward VII Gold Cup. 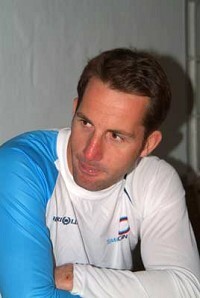 Brit Ainslie first came to Bermuda as an 18-year-old in 1995 and won the Youth Laser World Championships. Since then he's gone on to be World Sailor of the Year twice, Finn Class World Champion five times and has claimed a silver and three golds at the Olympics. He sat down with the Bermuda Sun this week to talk about the years in between and the challenges ahead as an Americas Cup skipper. What is your previous experience in Bermuda? I was here in '95 as an 18-year-old when I won the Laser Youth World Championship event and I was back in 2003 as part of Dean Barkers' crew for the Gold Cup. The youth worlds was the biggest event I'd won at that time and I went on to get silver in the Olympics the following year. Is it tough to switch to match racing after an Olympic campaign? It's a totally different mentality. I've done match racing as part of the team New Zealand crew in the Americas Cup before, which was a good opportunity to learn - but the focus over the last 18 months has been the Olympics. I've only done four days of match racing this year so this is going to be hard. 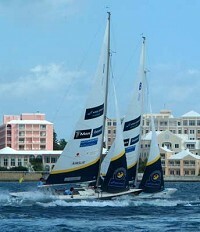 Is this the start of your Americas Cup campaign for 2011? I'm skippering the British team -Team Origin. It's going to be the same crew as I have here in Bermuda, so this is where our campaign starts. Next year we are hoping to hit the circuit hard and go for it. This is the breeding ground for the Americas Cup. From an individual point of view the Olympics is the ultimate, from a team point of view it's the Americas Cup. What are your ambitions for this competition? Normally I would say we would hope to win but we have to be realistic. We are up against it when you think of the preparation we have had, which is basically zero. We got a couple of hours in on Monday afternoon which was really crucial for us having done so little match racing and not having sailed these boats before. They are a very different challenge - it's going to be tough. But, we've got a really talented team so there is no reason why not. It just depends how quickly we can adapt. I started sailing with my family from a very young age and then racing Optis from the age of about ten. I just went one step after the other and it's been kind to me. It's gone well. The most recent gold medal in Beijing was the best so far. I was able to win the final race in really great conditions after a tough event. That was the most enjoyable Olympic win to date. I've got three golds and a silver in the last four Olympics, I've twice been World Sailor of the year and I've won five Finn Class World Championships. It's been a great career so far, I've been very lucky. But there are a lot of challenges ahead. Is it tough to stay motivated having won so much at such a young age? No, because there is still so much to achieve. The next Americas Cup is a big step up. Going into that environment and trying to get to the very top of the match-racing game is going to be a challenge. I'm also looking forward to the 2012 London Olympic Games on home waters. The chance to go for gold at home is a once in a lifetime opportunity. Outside of the medals, what other opportunities and experiences has the sport given you? Sailing's also given me the chance to travel. I've met a lot of interesting people, learned how to work with a team which is always important because you can end up in some pretty extreme situations when you are ocean racing. The Sydney to Hobart race is one that always tends to throw up some rough situations. We had some wild moments with the wind blowing 35-40 knots across the Bass Strait ripping spinnakers and all sorts of things like that - a little bit scary, but really good times. Sailing is a complex sport and it's about staying as cool as possible in those situations, making the most of what you have and backing your team. What are the ingredients that have helped you achieve all you have? A lot of hard work a lot of support from family, friends, sponsors, coaches and a bit of luck. Sailing is a really mental game - you are always learning, always gaining experiences and it's about keeping those experiences in the back of your mind and applying them to different situations. It helps that I've been on the water my whole life. Bermuda has a lot of talented young Opti sailors, any advice for them on taking it to the next level? I think it's great when you're young racing in the Optis, learning the skills and having fun but then you have to decide if you want to pursue it long term. You've got other distractions - other sports, girls, college. You've really got to take a decision and if it's something you want to go for then you have to go for it 100 per cent. Set some goals, try and get some support behind you and give it your best shot.